Explanation: Scientists are melting holes in the bottom of the world. In fact, several holes have been melted near the South Pole, and they are now being used as astronomical observatories. Astronomers with the Antarctic Muon and Neutrino Detector Array (AMANDA) lower into each vertical lake a string knotted with basketball-sized light detectors. The water in each hole soon refreezes. The detectors are sensitive to blue light emitted in the surrounding clear ice. Such light is expected from ice collisions with high-energy neutrinos emitted by objects or explosions out in the universe. 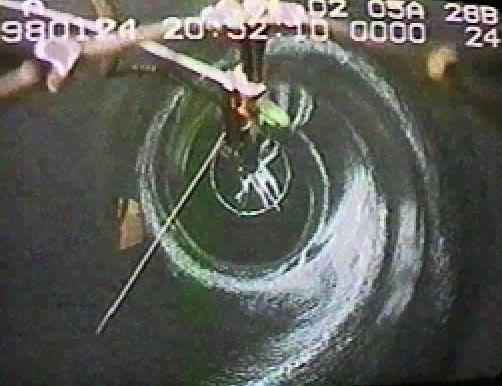 The above picture was taken 750 meters below the surface looking down into the abyss. 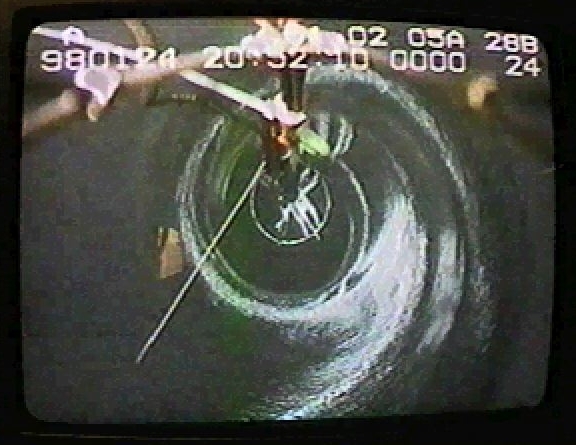 Instruments were lowered down past 2000 meters. Data from AMANDA is currently being collected and analyzed.